Millstone Power Station in Waterford, CT, where workers found water leaking that contained small amounts of radioactivity. 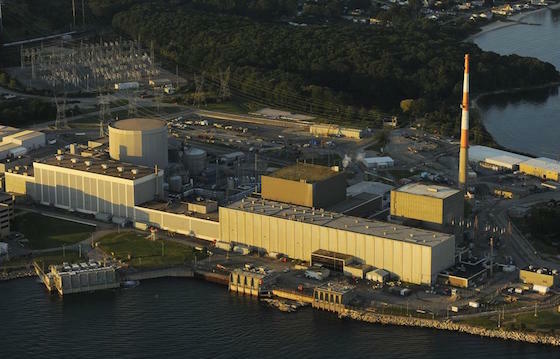 There was no public health, safety or environmental concerns resulting from a leak of water containing small amounts of radioactivity on the grounds of the Dominion Energy’s Millstone Power Station in Waterford, CT, state officials said. The leak was discovered Thursday during excavation of underground pipes undergoing inspection as part of normal operations, Millstone spokesman Ken Holt said. The leak and an undetermined amount of residual leakage was detected in the area of Unit 3, Holt said. Millstone notified local, state and federal officials about the discovery. The leak ended up contained and the pipe, which handles steam and water and flows to a storage-like tank known as a surge tank, is out of service until permanent repairs are made, Holt said. Water in the pipe, not unexpectedly, was found to have low levels of tritium, a radioactive form of hydrogen that occurs naturally and is also a byproduct of normal nuclear plant operations, he said. Tritium is measured in water by a measurement of picocuries per liter. The federal Environmental Protection Agency sets a maximum contamination level of 20,000 picocuries of tritium per liter of water for safe drinking water. Holt said tests of the water from the leaking pipe showed 17,000 and 23,000 picocuries per liter. Tests from monitoring wells around the perimeter of the leak fall within safe drinking water levels, Connecticut state Department of Energy and Environmental Protection spokesman Chris Collibee said. There are no drinking water sources near the leak.